Ciorba de fasole boabe – a comforting white bean soup made with bone broth, bacon, tarragon and lots of vegetables. In case you have seen my last post – the Romanian White Bean Dip – you might have read my tip about cooking more beans than necessary when making the dip. I always do that, it doesn’t matter if there are beans or chickpeas, if I want to make a soup or a dip, if I happen to be cooking pulses of any kind, I always double or triple the required quantity. Cooking beans and chickpeas is really easy, but it does take a lot of time and it costs energy. Plus I really don’t want to start cooking beans every time I need a handful or two for a salad or a dip. I do use canned pulses too, but if I have the time, I prefer to cook my own, they taste so much better and have such a nicer, creamier consistency. 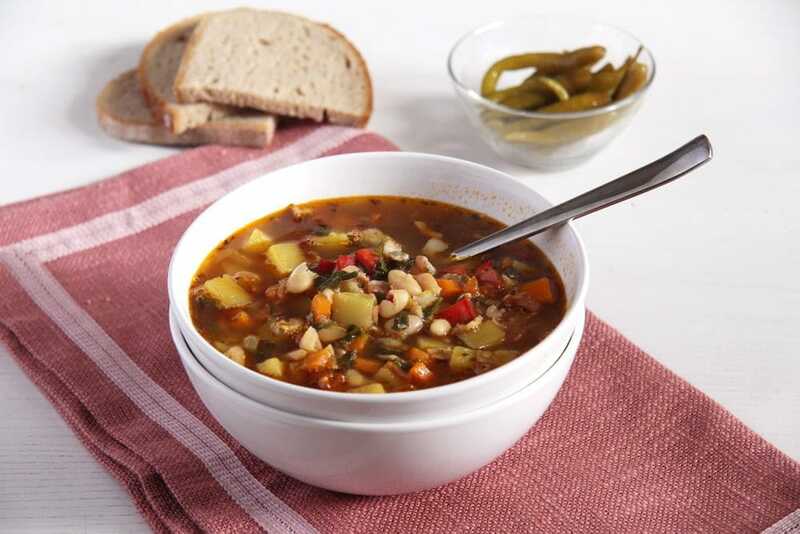 This comforting White Bean and Vegetable Soup with Bone Broth is a perfect fit for any kind of cooked beans you happen to find in your pantry or freezer. I make it with white beans most of the time, the white beans of any size are the most commonly used in Romanian cooking, I grew up eating them, so I like them best. But feel free to vary the sort of beans according to your liking. I cannot guarantee that using black beans will be the same, as black beans do have a really particular taste, but pinto or kidney beans would be nice as well. This White Bean and Vegetable Soup with Bone Broth is the kind of soup my grandmother used to cook mostly in winter. Not only it heats you up from the inside and has a lot of energy, but it is commonly eaten with pickled hot peppers, which can really make you sweat thoroughly, if you take too big a bite out of them. And what can it be better than a steamy soup full of beans, bacon and potatoes on a snowy day with temperatures below minus 10 degrees Celsius? She used to make this soup using knuckles of pork, which were absolutely delicious. However, I find that cooking knuckles of pork these days just doesn’t fit my (diet) plan, so I gave up the knuckles (or to be precise: I’ve never ever cooked a knuckle of pork myself) and use lean bacon instead and a nice, healthy beef bone broth. The choice of veggies is not an exact science either, my grandma used to take whatever she found at the market. However, root vegetables like carrots and celery root should be present in the soup for a genuine taste and I just could not give up the red bell peppers. I love them now just as much as I hated them as a child… Otherwise you could use some zucchini in autumn or some parsnip or parsley roots in winter. 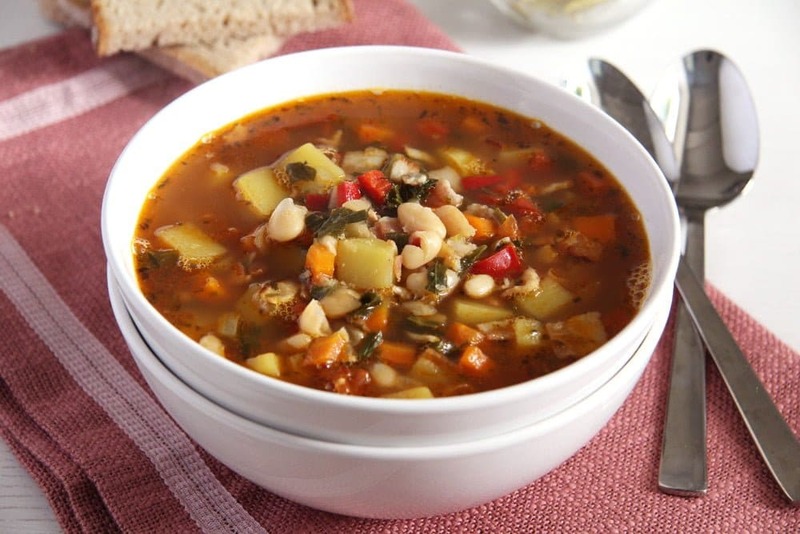 Potatoes are not entirely necessary, my grandmother never made this White Bean and Vegetable Soup with potatoes, but my children like them and they help me reduce the bread I would usually eat with this soup. 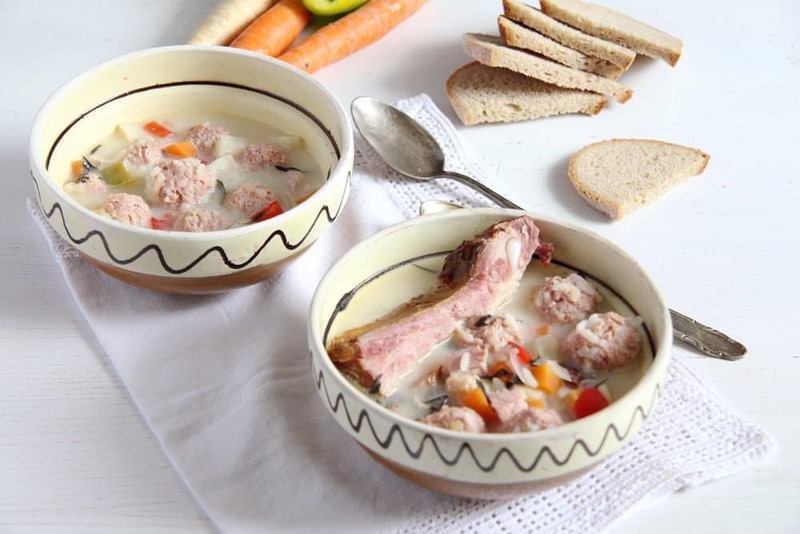 Romanian soups (ciorbe) normally have a sour touch. In many parts of the country, people use borsch to sour the soups, which is some kind of fermented wheat. However, borsch is not very common in our area and my grandmother never used it herself (she probably had it once, decided she didn’t like it and never tried it again). She always used vinegar to give soups their sour touch and I continue this tradition. In this case I used the vinegar used to pickle the tarragon leaves I put in the soup. I pickle my own tarragon leaves every summer, but as I assume that most of you don’t do that, just use dry or fresh tarragon for the soup and white wine vinegar to sour the soup. This particular White Bean and Vegetable Soup with Bone Broth is not vegetarian, but you can easily make it vegetarian, if you wish. Just leave out the bacon and use vegetable stock or the bean cooking water instead. And spice the soup very generously at the end. Ciorba de fasole boabe - a comforting white bean soup made with bone broth, bacon, tarragon and lots of vegetables. Rinse the beans and place them in a large bowl. Cover with water and leave to soak overnight. Rinse again, place in a large bowl, cover with plenty of water, add only 1 halved onion and 2 of the bay leaves and bring to a boil. Cook for about 1 hour or until the beans are soft. The cooking time will depend on the size and age of the beans so keep checking. Drain the beans but keep the cooking water. Discard the onion and the bay leaves. Chop the second onion finely. 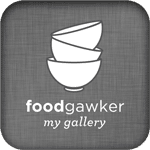 Chop the carrot, celeriac/celery sticks and red bell pepper into small cubes. Heat the oil in a large soup pot. Add the bacon cubes and fry gently until they render their fat. Add the vegetables and cook, stirring often, for about 5 minutes until they start to soften. In the meantime chop the potatoes into small cubes. Give the potatoes to the soup, stir for about 2 minutes more, then add the cooking water from the beans and the beef bone broth. Add all the dried herbs and the cooked beans. Cover and bring to a boil. Lower the heat and simmer gently until all the vegetables are soft (check the potatoes), about 20 minutes or so. Adjust the taste with salt, pepper and white wine vinegar. If using pickled tarragon, chop it finely and add it to the soup now together with some of the pickling vinegar. Start with one tablespoon, taste the soup and continue adding more, a little at a time, until the soup tastes to your liking. I do like mine rather sour, so I sometimes end up adding 4 or 5 tablespoons vinegar. 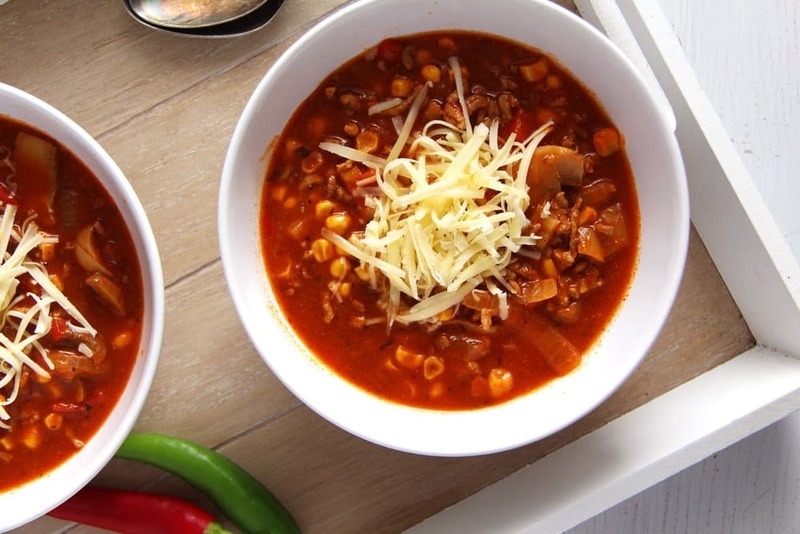 Note 1: Cook more than the beans needed for this recipe – you can easily freeze the rest for future use (dips, stews, salads) and cooking a lot at a time saves time and energy as well. You can even freeze the cooking liquid for making more soups or dips in the future. 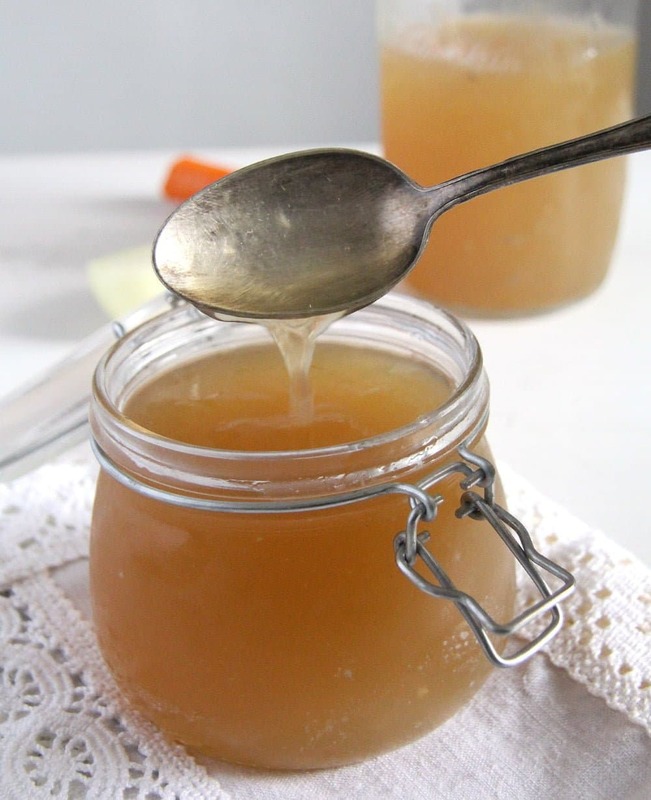 Note 2: If you don't have any bean cooking broth, use more beef bone broth. If you have more bean cooking broth, you can use it all for the soup and adjust the beef broth quantity accordingly. Note 3: I pickle my own tarragon leaves every summer, but as I assume that most of you don't do that, just use dry or fresh tarragon for the soup and white wine vinegar to sour the soup. If you are using pickled tarragon, leave out the dry one and add the finely chopped pickled tarragon at the end of the cooking process. Use the pickling vinegar to sour the soup. I love foods that remind us of someone special and your grandmother sounds very special, as does her soup! I bet it’s particularly delicious with homemade broth! It is cooooold here and we are finally supposed to get snow tomorrow, so I am in NEED of bowls of soup on repeat! This one looks delicious! 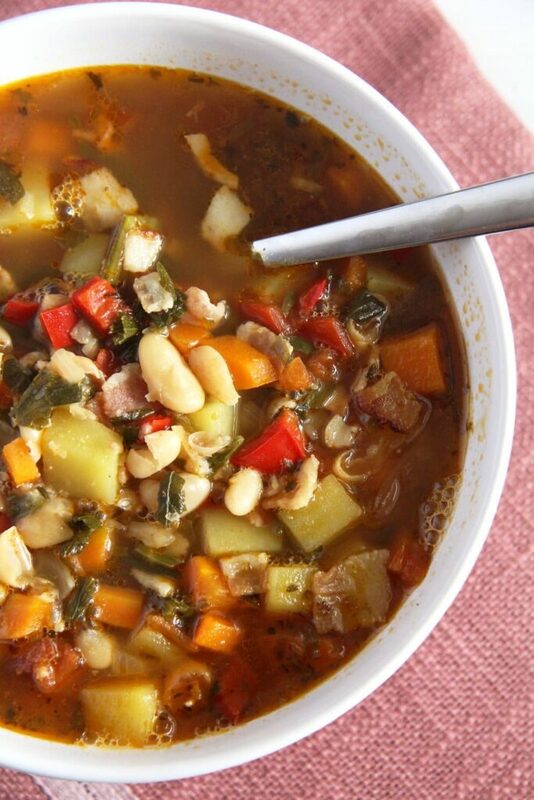 I love a hearty, yet healthy bean and veggie soup, so this is right up my alley! Cheers and Happy New Year! Welcome to Yum Goggle! We are following you on Twitter and Instagram. If you have any other social media platforms – please follow us and we’ll follow you back then we will try to tag you each time we promote your posts. Kelli at YG! 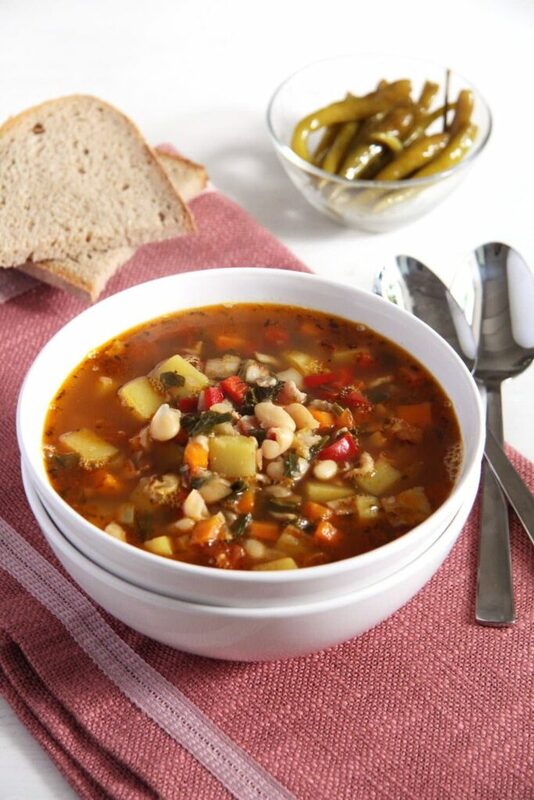 I love beans and vegetables and this soup looks just so delish. Love how comfy and full of flavors this is. Your Grandmom sounded like a very person, Adina. Thanks for this wonderful recipe.